All content is in English. Almost all Exton Linux distributions can be downloaded from The Swedish Linux Society server. I just buy raspex-arm-android-lollipop-5.1 but I’m confusing how to install it via windows 8.1. Could you send link or doc tutorial how to install it via windows. I’m not install linux in my laptop. As I say on the info page you need to do the installation in Linux. If you don’t have a Linux system on your computer you can run a Linux system live from CD or a USB stick. Where are your user Forums? I would like to try your distro. Also, is there a reason you did not go with KDE Plasma? If you talk about ExTiX one version has KDE plasma. You can ask your questens here. I have some problems with ExTiX web site right now. I liked the LxQt distro. One problem though. When I clicked the install in the menu it did nothing but just sat there? Is there a fix to this or did I just get a bad burn. Thank you. The installer will then start. I have modified the desktop to suit my tastes A quick launcher on the left with most used applications; a panel on top with menu, task manager; clock and volume control and a 3rd panel on the bottom for indicators and notification area. I like this setupon my widescreen 1900X600 display. I’m having trouble with Steam games opening but I’ll work it out. A missing lib maybe. Anyway Thanks for a great distro. ps. Any chance of an irc channel for support until forum is up, or is ExTix too small? Regarding ExTiX 15.2 LXQt Live DVD and ExTiX 15.2 KDE Live DVD, just a usage report. Both work well running in memory on my fairly standard Intel hardware (with 4 GB RAM). LXQt is fast and appealing to someone like me who doesn’t like Unity or the new Gnome. Either would be a good choice for many users, some of whom probably try Ubuntu or Red Hat and give up. As for myself, I’ve been satisfied with Kubuntu and likely will stick with that. openSUSE is good too but a bit bloated, and I noticed that you’ve kept your KDE version quick. You did leave part of your browser history behind though on the disks though. Thanks and good luck, tixer15 (a Canadian Linux user). Thanks for your report. I wish more users would do as you have done. I.e. share their experiences. Sorry, but I have no solution for you. Please let me know if you find one. I have a bit problem attaching usb or usbhdd to slackex/exton. When I attached usb or usbhdd and click on to mount button, on lower part shows error cannot mount. Manually it works (mkdir+mount). Ex. In Porteus it works well. Hi. Just downloaded the latest extix. Very fast. I want to use the XFCE desktop instead of the LXDE desktop. It’s much nicer. I’ve installed the XFCE panel. How do I swap it out for the existing panel? It won’t be ExTiX LXQt then. And it won’t be fast anymore. Xfce needs a lot more packages than the panel package. install persistent with your script and I have use many USB pen drives. exactly as you describe it. After doing step 6, the system works. Loads and runs nicely but without persistent. If I applay step 7, i am not able to boot from the stick anymore. The latest Exton|OS Light is from 150727. You are trying to install a version from 141117 (and not the “light” version). Why? That was only a copy n paste of the “how to make persistense” from your website. I used sandisk USB sticks as well as other brand names. Any glue what it could be? If I stop after step 6 i get a bootable Exton version on the stick with no persistent. Applying the script you point on step 7 makes the stick unusable again. Ok, I understand (now). You’re not doing anything wrong. Perhaps the script doesn’t work after my latest updates of the system. I can’t check it now since I’m on vacation. You could try UNetbootin instead. This is what I wrote about it: You can also use UNetbootin in Windows or Linux. See a picture how it looks before the installation starts in Windows 8.1. NOTE: You must replace syslinux.cfg in the root of the stick with this file. (Also so you can enjoy persistence and run Exton|OS from RAM). persistence and runfromram is exactly what I need. Hi. Using Exton, latest build. I use an app called Isoplex. I invoke it from an executable. Consequently it doesn’t show up in any of the application menus. I want to add it to the bottom panel. I can’t figure out how to do this. Can someone help me? Thanks. I guess you mean ExTiX 15.4 LXQt or KDE build. The best way to fix this is to edit one of the files in /usr/share/applications and save it as isoplex.desktop. Your app will then show up in the menu. You can then easily add it to the panel. 1) is it possible to use the persistence on ExLight USB-stick after you choose to run from RAM? 2) how can I change default system’s locale permanently on ExLight USB-stick to boot using Norwegian Bokmål nb_NO.UTF-8, Swedish sv_SE.UTF-8 as fallback nr.1 and en_US.UTF-8 as fallback nr.2 (LANG=nb_NO, LANGUAGE=nb_NO:sv:en)? 1) Not from the start, but if you use the persistence alternative and make some changes and after that run ExLight from RAM your changes will be there. I hope this is the right place to post this. I am running Mint cinnamon 17.3 I installed the Exton kernel 4.4 everything works fine except when I went and installed Virtual Box I kept getting a error message and the kernel would not compile with the DKMS and Virtual Box. and the program would not install. I dropped back to the old 3.19 kernel and everything installed and ran fine. I just wanted you to know. Thanks for all your work. Did you install VirtualBox from https://www.virtualbox.org/ ? If not I think it will work if you do. I want to install exGent on a hd with more then one partitions /boot, /, /home, /tmp and /var . How can do it? 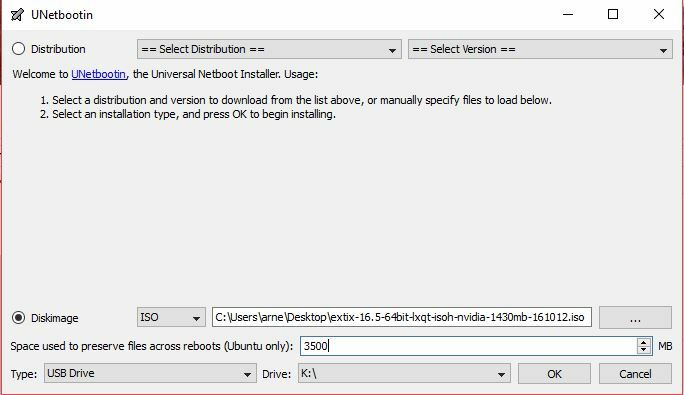 How can i modify install procedure? Sorry, but I don’t know how. I always install my Linux systems on one partition. Following a recent favourable review and subsequent download of Exlight, I was disappointed that unlike its big brother (Extix), Bodhi (recent), and several other distros, it failed to recognise my wifi dongle. I had hoped to run Exlight from an USB stick with persistence, but unfortunatly the lack of wifi is for me a deal breaker. In all other respects I was impressed with Exlight, and would give it another go if I could find a way to get my wifi working. So, any suggestions as to how I might achieve it? Did you try to change Wicd’s preferences? In version 160612 I have replaced NetworkManager with Wicd to make it easier to configure wireless connections. Now just start up Wicd-client. Give your WEP/WAP password and connect. That’s it! Maybe you will have to change your network interfaces (eth0, wlan0) to for example eth1 and wlan1 in Wicd’s Preferences and click on the button Refresh before you can connect. Hi i want to bay a iso Puppex … Is not god to download is bad . i gone use that to bank mm . I have use debian live but engelsk tangentbord . Normalt är det inga problem alls med att ladda ner från Sourceforge.net. Kan dock vara något tillfälligt fel. Prova igen! I installed RaspEx on a Raspberry Pi 3, everything OK, but when I try to open a video in some websites like bbc.com with FireFox the video ouput is fine, but the audio is a noise similar to the noise on the file /usr/share/sounds/alsa/noise.wav. Maybe you can, but I don’t know how to do it. You can edit /boot/config.txt if you insert your card while running a Linux system. How do I make Kodi run on build 170221…when I start Kodi it goes to blank screen, not sure if just a video problem or just hung. screen saver still works. Other than problem this distro runs perfect.. Unfortunately you can’t run Kodi in RaspEX Build 170221. (Or I don’t know how to do it). Thanks for the speedy response. I guess I am still looking for the perfect OS for raspberry pi. I loved the GUI on the 170221. I have the 160426 but not crazy about the GUI and the little boxes with txt almost too small for me to read..I will keep searching, thanks for all the god work you do. I have been using your distro’s on and off for years. I do not know how you get the time to do all this really. But I was wondering if you have a prefered server software, that would be suitable for a home network. Perhaps also a network manager. An just going to try kitkat and mashmallow. Thanks very much for your efforts, very much appreciated. Although I could not get the etcher or rufus programs to work with exGENT, I did use virtualbox to boot up the iso and then installed the system to the virtualbox disk. Yes, as I say on the INFO site that can be done very easy. Note that yesterdays (170309) version of exGENT can be installed with Etcher and/or Rufus. After that you can emerge (install) new programs/packages while running the system from the USB stick. If you do that and later on decide to install exGENT to hard drive all your changes will follow! worries that u missed my post………….shame is I been posting ur link in AC being a DEV. But you failed a simple request. i want use the Raspberry Pi3 to listen radio with usb-stick (rtl2832u). I can install on raspand nougat 7.1.2 the app “wavesink” and the driver “RTL2832U driver”. When I start this app, the system will hang and I can only restart with power off about power supply. Have you any idea? Can I use your system with “wavesink”? Best regards and having a successful start to the new year.